Many people believe Daylight Savings Time was invented by Benjamin Franklin because of his 1784 essay called “An Economical Project for Diminishing the Cost of Light.” In it, he described being shocked upon accidentally awakening early in the morning to see that the sun was already up. After painstaking analysis, he concluded that changing the hour, resetting all clocks, rationing candle wax, enforcing a mandatory curfew and firing cannons at sunup would encourage the citizenry, who would otherwise fail to realize they could simply rise earlier, to take full advantage of daylight. One wonders if Franklin had to endure the utter lack of understanding of satire so commonplace since the invention of the Internet. What has that got to do with office supplies? Not much, unless you work by lamplight or in a post-apocalyptic hellscape without electricity, which sounds like the saddest Dilbert cartoon ever. A nice bit of Benjamin Franklin trivia may not get you far at a cocktail party, but it could be the secret handshake that gains you entry into the Dull Men’s Club (DMC), originators of the biannual Fill Our Staplers Day. That sounds perfectly reasonable to us. 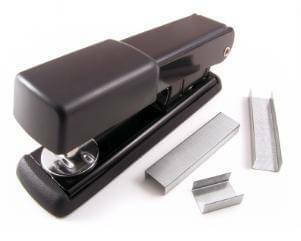 Have a happy Fill Our Staplers Day! March 12, 2016, is International Fanny Pack Day. Nick Yates, who founded the holiday in 2007, drew inspiration from an experience he’d had a few years earlier. Yates had received a fanny pack and fruitcake as gag gifts at a Christmas party in Portland, Oregon. Lured by its practicality and convenience, he strapped on the pack and stuffed the foil-wrapped cake inside when he left. While walking to the bus stop, he encountered a homeless man who said, “Nice fanny pack, chief.” Yates replied, “Thanks,” unzipped the bag, handed him the food and continued on his way. Although many would consider this just one more harsh (and humorous) critique of fruitcake, Yates made a connection between the fanny pack and helping the hungry. He began to give out food—but no more fruitcake—while wearing the pack. He continued the tradition after moving to Boise, Idaho, coordinating efforts with friends and local food banks. 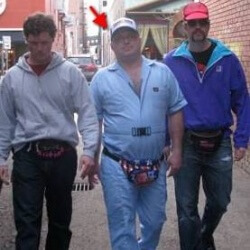 In 2007, he declared the second Saturday of March to be International Fanny Pack Day. Since then, the holiday has been observed in seven countries. Be the first one on your block—or outside the carnival—to wrap a snake around your middle. But if you wear it in England, be sure to call it a “hip pack,” “bum bag” or anything else. There, “fanny” is slang for a woman’s privates. If you require more convincing that this is a fine sartorial option, check out this awesome video from Year of Cheer! Happy International Fanny Pack Day! March 10th is World Kidney Day (WKD), created in 2006 to promote awareness of kidneys, their vital role in our bodies, and their susceptibility to often preventable diseases. The holiday is co-sponsored by the International Society of Nephrology (ISN) and the International Federation of Kidney Foundations (IFKF). Nine thousand healthcare professionals in 126 countries are members of ISN, a non-profit society founded in 1960. The IFKF was created in 1999 to improve treatment and promote research; members include 63 kidney foundations and patient associations in 41 countries. Each year’s observance focuses on a different theme. 2016’s WKD theme was “Kidney Disease & Children. Act Early to Prevent It!” Its goal was to get the word out that children are vulnerable to Acute Kidney Injury (AKI) due to kidney blockage or traumatic injury, and Chronic Kidney Disease (CKD) caused by birth defects, hereditary or systemic diseases and nephrotic syndrome, among other factors. World Kidney Day 2016 ‘Move your feet’ campaign urges everyone around the globe, from all cultures and ages, to keep fit and active. This campaign is a symbol to encourage people to maintain a minimum level of physical activity in any way they can, with their own means and frequency, regardless of their physical condition. Small steps can make a difference to keep healthy kidneys and we value every single effort. Most people know that high blood pressure raises risk for heart attack and stroke; it’s also the most common cause of CKD. Exercise helps lower blood pressure and has many other health benefits. Half of all diabetics will develop kidney damage at some point. Keeping blood sugar at a healthy level and having kidney function monitored with regular blood tests can reduce or prevent damage. Staying hydrated helps the kidneys flush sodium, urea and toxins from the body. Some studies claim it can lower the risk of kidney damage. There is little agreement on how much water is optimal, although experts agree that extremely high intake can cause life-threatening side effects. Over-the-counter medications such as ibuprofen and other non-steroidal anti-inflammatory (NSAID) drugs are known to cause kidney damage if taken regularly. Chronic users should consult their doctors to find a safe way to manage their pain. Finally, here’s yet another reason to quit smoking: It slows blood flow to the kidneys, impairing their ability to function normally. Smokers also have a 50% increase in the risk of kidney cancer. After cessation of smoking, risk drops; after ten years, it is the same as that of a non-smoker. Events are going on worldwide right now. Not near one? Start your own. All you have to do is put your best foot forward. 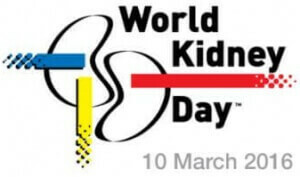 Have a happy and healthy World Kidney Day! The International Festival of Owls takes place during the first full weekend of March at the International Owl Center in Houston, Minnesota. It celebrates the approximate “hatch-day” in 1997 of Alice, a Great Horned Owl rescued as a fledgling after falling from her nest. She now helps teach visitors to the Houston Nature Center about owls and their behaviors. 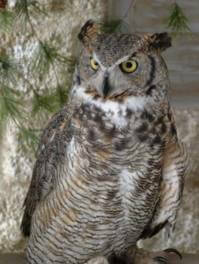 Today’s events include live shows featuring Ruby the Great Horned Owl and Uhu the Eurasian Eagle Owl. A discussion of the complexities of renesting young owls will include appearances by Barred Owls, red and gray Eastern Screech-Owls and a Barn Owl. There is also a special live owl program just for children. Tonight three buses, each with an expert owl caller onboard, will embark on an Owl Prowl. Calling stresses the owls: they respond out of alarm that there is an intruder nearby. To minimize ill effects, each group must travel to a different remote location where the birds are unlikely to be bothered again during the year. Of course, there is no guarantee that passengers will hear wild owls, in which case they’ve just endured a bus ride to listen to a grown person make strange noises. Two of the buses are family-friendly; the other is reserved for adults. (Perhaps there will be potty talk about mating rituals that the kids shouldn’t hear?) Those who don’t want to make the trip can stay behind and look at the live owls on display, peruse the gift shop, cast votes in the photography contest, visit owl merchandise vendors and eat owl-themed foods. Saturday’s Kid’s Hooting Contest is no joke. The International Owl Center lists the best species to mimic and links to audio files via Owlpages.com to help competitors perfect their hoots. Also recommended is Owling.com, which accompanies accompanying audio with streaming video, photo galleries and field notes. Did you know that owls vomit up the parts of their prey—bones, feathers, fur—that they can’t digest?This daily activity causes the resulting “pellets” to accumulate on the ground below their nests, where they are retrieved by festival staff for the Owl Pellet Dissection sessions, scheduled on Saturday and Sunday. Pellets cost $5.00 each; parents can economize by assigning more than one child per pellet. Under no circumstance is anyone allowed to BYOP (Bring Your Own Pellet). Management is not responsible for emotional scarring that may occur to children who connect the dots between beloved characters Ratatouille and Mickey Mouse and the rodent bones they have just fished out of a nugget of owl barf. Have a happy International Festival of Owls!